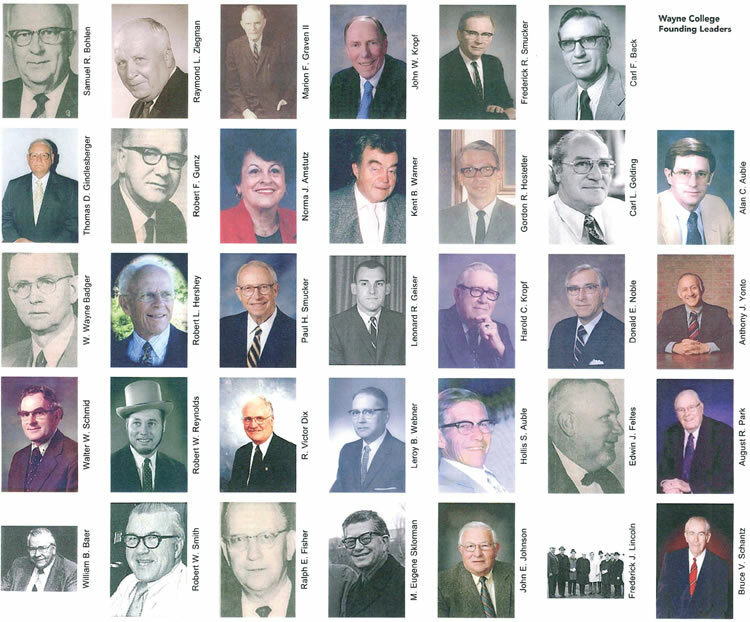 Wayne College is honored to recognize those individuals instrumental in the College’s founding. Carl F. Back – Vice President, Sanderson Cyclone Drill Co.
William B. Baer – President, The Will-Burt Co.
Samuel R. Bohlen – President, Snyder Oil Co.
Carl L. Goldring – Owner, Perilstein Co.
Donald E. Noble – CEO, Rubbermaid, Inc.
Bruce V. Schantz – President, Schantz Organ Co.
Robert W. Smith – Director of Purchasing, The Will-Burt Co.
Paul H. Smucker – Chairman, The J.M. Smucker Co.
Anthony J. Yonto – CEO, Quality Castings Co.
Raymond L. Zeigman – Vice President, Quality Castings Co.